Vivaldi Technologies has released Vivaldi 1.6, a new stable version of the up and coming web browser to the public earlier today. 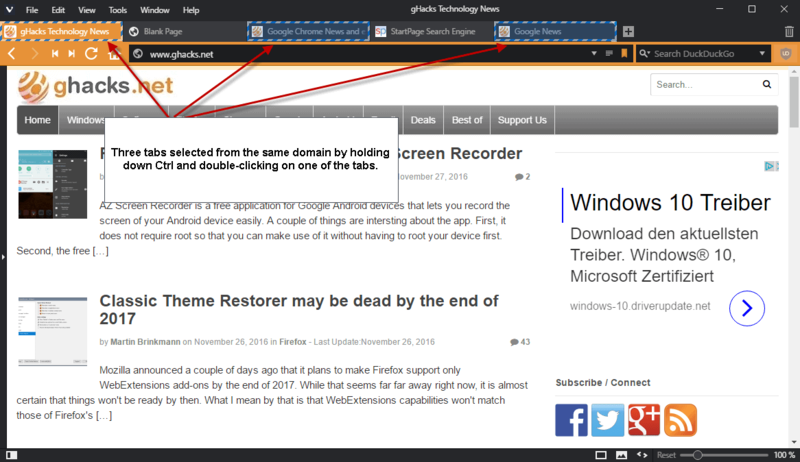 The new browser ships with a bunch of tabbed browsing improvements, fixes, and core updates. I'm keeping a close eye on Vivaldi as I like where this browser is headed. New stable versions are released regularly by the small team, and development progresses in a good pace all in all. The next year will be an exciting one for Vivaldi Technologies, as the company plans to release the first mobile Vivaldi version and the promised email client then. We reviewed the first new feature that Vivaldi ships with already. Title Tab Notifications improve how notifications are shown in the browser's tab bar. Some sites, Twitter and Facebook for instance, change the title of the page by adding numbers in front of the title that indicate the number of unread notifications on the site. This may remove part of the site's title. Vivaldi 1.6 tries to detect those title changes to move the notification to a counter attached to the tab without affecting the page title. Also, counters are supported on pinned tabs and regular tabs. 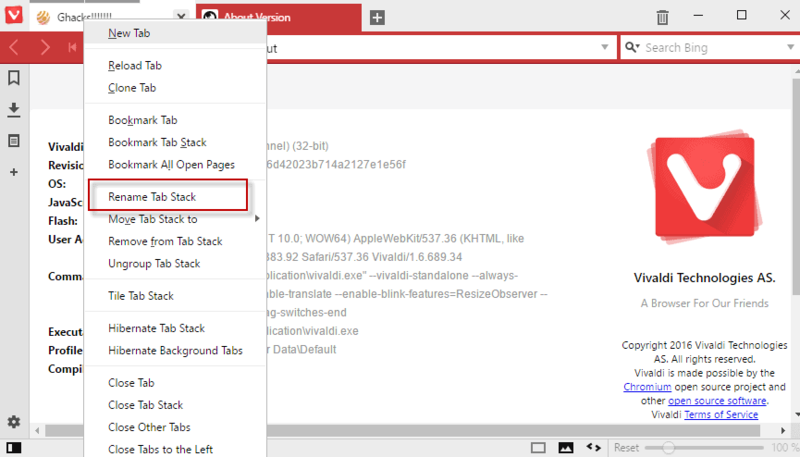 The next feature that is new enables you to rename tab stacks in the browser. I tried the installed version and a new portable version of Vivaldi 1.6, and both did not show the "rename tab stack" option. I read that the feature is broken in German, but both installations used English as the interface language. I noticed that the feature is not enabled by default. You need to enable it with a click on Vivaldi > Tools > Settings > Tabs > Allow Tab Stack Renaming. What it enables you to do is rename the tab stack so that it shows text you select instead of the page title in the tab bar. This can be useful if you need better identification of the tab stack and don't need the page title of the selected tab of the stack to be displayed. We have reviewed the third new tab related feature previously as well. Tab selection by domain enables you to quickly select all tabs of the same domain. To make use of this simply hold down the Ctrl-key on the keyboard and double-click on any open tab. All open tabs of the same domain will be selected then. This is useful as you can now drop the to a new window, bookmark them all, or create a tab stack. The new Vivaldi 1.6 ships with improvements and fixes in many areas including reader mode, extensions, bookmarks, interface, and search. You can read all about the changes over on the Vivaldi website. Now You: What's your take on Vivaldi 1.6 and the browser in general? I think Vivaldi has a high potential to be the best chromium based browser but there are still some under the hood technical issues that makes it hard for daily use. Now, I can’t talk specifically in technical terms but the UI seems very sluggish most of the time. Every button, that includes even switching tabs when you have more than 10, has a slight delay to them. Start-up time is also very long both cold and hot. Add a few extensions and it becomes even more tedious to do simple things that requires UI navigation. I’m currently trying out Cent Browser. I’m a bit cautious as I don’t know how secure and trust worthy it is. But it’s very fast in terms of UI navigation and multiple tab handling, even with 5-6 extensions installed. Faster than my usual experience with Chrome and Vivaldi. I feel the same when testing Vivaldi. The UI is laggy. I end up uninstalling it after a few hours and going back to Cent Browser. Opera UI is also pretty smooth. Laggy? I have like 100 tabs opened all the time, ending the session and opening with them and I have no delay. Maybe you’re using 32-bit client? Try 64 if you have 64-bit OS. And I have no fresh expensive PC. Just an old i5-750 processor 8GB DDR3 and GF770. Windows 10 Ultimate. The only laggy thing I found is opening a new tab with these 100 opened, but other gestures, switching between tabs and panels is fast. What do you mean by “real”? A seperate .exe or an archive? Next to the portable option during installation already available in the installer of course. Real portable = it does not leave behind any entries in the registry or filesystem. Good stuff. Previous version had a bit slower startup than the one before, but it’s OK again now. Also, Chromium 55 is a relief, the other day I was testing Chrome 55 against Chromium 53 and with the same add-ons and the same 10 heavy webpages open, old Chromium needed almost 200MB more of RAM. Now that Vivaldi and Opera are based on 55 too, although they’re not as light as Firefox, they are perfectly usable. I’ve been trying Vivaldi as an alternative to Firefox. 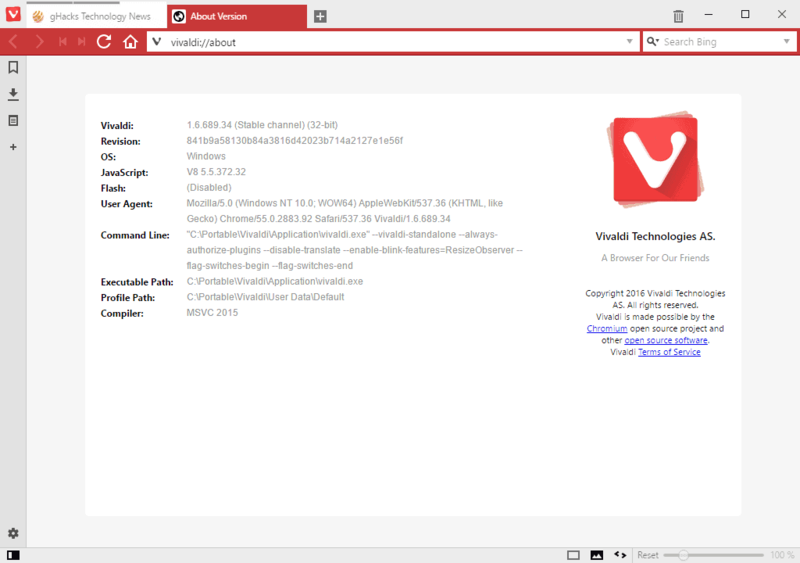 What I would like the Vivaldi team to do is to make it possible, to start the browser right away in private browsing. There also seems to be a glitch in deleting all the private data since it always goes back to “past hour”. The “show panel” in my opinion is bulky and it takes a while until the browser starts up having only 3 extensions installed. On the whole I like Vivaldi and if the team in time will fix this and that this browser may become my first choice since Firefox is getting heavier and heavier, but I still like its diversity to adapt to personal needs. I agree that there seems to be a glitch in deleting all the private data. Mine doesn’t keep going back to “past hour’; it stays on the obliterate from “the beginning of time” setting, but it has happened on more than one occasion that even after I have done this and Vivaldi is showing that all cookies are deleted, CCleaner has still shown some remaining cookies. > It’s the first time I see different colour themes in a program that are actually worthwhile, elegant, and offer a credible alternative to the default. Maybe a graphic designer contributed to this, as opposed to the usual developer fiddling with controls and delivering horrible visuals. > The bookmarks manager (full-screen) seems broken. As soon as one clicks into a bookmark, the website opens. The expected action is mere selection, in order to move, rename, delete, etc.